In either case, you need some help if you want to save yourself some valuable time. 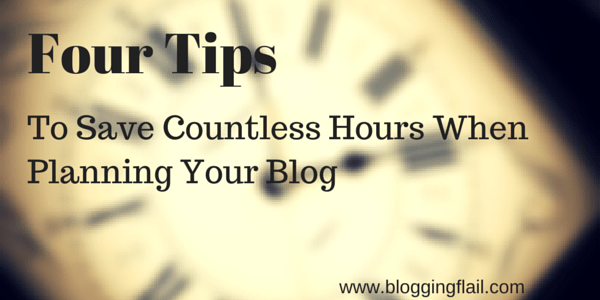 These 4 tips will save countless hours when planning for the setup of your new blog. As with everything in life, it all starts with planning. You wouldn’t build a house without a blue print would you? You don’t go shopping without knowing what you want to purchase. You don’t start coding without knowing your requirements. Heck, you don’t start any type of project without doing the proper planning. If you do, the result typically doesn’t turn out the way you envisioned. The same holds true with blogging. Sure you can jump right in and start cranking out posts in WordPress, but if you don’t have a plan, your blog will fail! These tips are based upon my past experiences. These are real life examples, not some pie in the sky theory that hasn’t been practiced. There are countless guides on the Internet on how to start a blog. Read them! Don’t assume you know what to do. Even if you think you know, read these guides. At a minimum, you’ll glean a tip or two that will save you time down the road. Your total investment, maybe 30 minutes of reading. It’s well worth it. I can’t stress this point enough. This will save you re-work down the road. Most new bloggers think, I just need to install WordPress and I’ll be off and running. What they fail to comprehend is if you don’t set things up properly at the beginning, it will lead to more re-work. Who has time for that? Get it right the first time, and you can focus on your content and gaining traffic for your blog. Get your permalink structure right before you publish your first post. This is important for SEO purposes. If you fail to address this now, you’ll have all kinds of problems down the road. Sure you can change this structure at any time, but be prepared with having to implement redirects for all of your posts. More time consuming administrative work that you don’t need. Think about where you want to install the WordPress instance on your site. Is it going to be at the main domain, in a sub-directory, or as part of a sub-domain? Think it doesn’t matter? It most certainly does if your at all concerned with SEO. The theme is the basic design of your site. If you’re just starting off, pick a theme and move on. You’ll have plenty of opportunities down the road to change the theme. It really shouldn’t be something you put a lot of focus into right now. When it comes to theme’s, you have two choices — free and premium (paid). Personally, I would go with the free route if you are just getting into blogging. A light weight free theme I’ve used in the past that is both fast and optimized for SEO is the Swift Basic Theme. There are a ton of things you can do to customize the design of this theme. I’ve had great success with it in the past. If you’re interested in the premium route, look into the Genesis Framework (that’s what I use on Blogging Flail). There are many child themes to choose from that run with this framework, and you’ll drive yourself crazy trying to find the right one. Since you’re just starting off, keep it simple, and use the Prose Theme. Once you have your blog up and running, you’ll be dying to get traffic, comments, and social media shares. This is by far the most frustrating part of blogging, and the primary reason so many blogs fail. If you’ve done any research on Search Engine Optimization (SEO), you know a key component of Google’s algorithm is the number of links that are pointing to your site. You’ll be tempted to do anything, and I mean anything, to get these links. Under no circumstances should you pay anyone for a link. Not only is it a waste of money, but your blog could end up being penalized by Google which will only hurt your rankings. One of the easiest and cheapest ways of getting links is by using a service called Fiverr. For a measly $5, someone you’ve never met will give you 100’s of links or offer you a guest post on some high Page Rank blog. Don’t fall for it, it won’t help, I’ve done it before. It all comes down to planning. Resist the urge of jumping in to create your blog as soon as you have an idea. A little bit of planning will go a long way and save a tremendous amount of re-work (time) in the long run. Some sound advice indeed – I’m with you on all of this! I have been guilty of all of these things at some point over the past few years. If only I had a guide when I started out for even the basics – like setting up permalinks optimized for SEO for example. Even the theme thing I have been guilty of recently. My blog has seen 3 themes in under 2 years. The key is nailing down what you want over a period of time and not making rash decisions. Links. Ah yes. Fiverr. DOH! I use Fiverr for a lot of things, link building is not one of them you’ll be glad to know. There’s no real shortcut to getting high rankings – Google will catch up with you at some point. The only way to get good rank is to build a high quality site and do things naturally. Great tips Craig, sharing this baby out now. Great post Craig. I agree, some great advice. I’m going to echo much of what Richard already said. Been there, done that. I also made the mistake of buying links from places like Fiverr. Obviously I couldn’t prove it, but they sure seemed to do more bad than good. It’s not surprising because most gigs are just forum profile links, which have been bad for some time. How else could they do 100’s of links for $5? Some time back I bought a big back link package from a guy on the WF. It killed my site in just a couple days and it never did recover. Costly mistake. Before the links is was starting to grow and make sales, then dead in the water. Appreciate you taking the time to comment! I agree with Richard, sounds advice. Now if I’d only had this when I created my blog back in 2009. The domain was easy, I was taught to brand me so to use my name. I already had hosting because I had a static website back in the beginning days. So those two things were in place but I didn’t have a clue what I was doing accept I know setting it up was the easy part. I bet I continued to search for themes for months. I’d find one, start using it and not like it and then spend an entire day looking for another one until I bought Thesis which I still have today. I do remember though being taught about permalinks early on and thank goodness for that. The rest of the stuff I stumbled over but I’ve never purchased links or done anything of that nature. I took the s-l-o-w route but I’m glad I did. I think there is just much more information out there today than when I got mine going but it’s still not complete in my view. There are so many behind the scenes things people need to know about that they aren’t being told until later down the road and then fixing all those problems can be a nightmare. I ought to know, it’s happened to me more than I care to recall. LOL!!! Great share and thanks for these tips. New bloggers will thank you. Thank you for the kind words Adrienne! My hope is that this will help someone that is just starting off, I know these things tripped me up when I first started, and it takes time when you have to go back and recover from them. Boy, I wish I had known about not paying for backlinks when I had my first blog. I wasted a lot of money. I won’t say I waisted a lot of money on backlinks, but i did fall into the trap of pursuing them for all the wrong reasons. I learned my lesson. I agree with everyone. This is sound advice and really useful to anyone who’s just starting out with their blog. When I set up my blog, I was told to use a particular free theme which was also great for customisation – Flexibility 3. I used that for quite some time before graduating to Pagelines and then finally to Genesis. It was tricky to know what to do when I set up my blog originally. It was part of an online course I was taking and the advice was – write 5 blog posts to get started. Great. About what? I gradually found my way. That’s not an advisable way to do things though. I’ve never purchased backlinks and don’t intend to. It took me a few months to get PR2 and increase my traffic. So I don’t want to hurt that in any way! Great that you’re sharing your own personal experience here Craig. Thanks for stopping by and commenting Tim, very much appreciated. Haven’t taken any courses, just trying to find my own way as you stated, and follow the advice (free) from some of the more experienced bloggers out there. It’s amazing how much everyone is willing to sharing. I’m somewhat annoyed at myself for taking so long to figure this networking thing out. Thank you very much for this info. I have planned to start my blog in the new year and have been madly reviewing everything I can get my hands on. This write up is clear and I am impressed with the advice. The theme has been on my mind and the one you suggest, well I will check it out. But most importantly I appreciate the advice about being desperate for traffic, I mean I knew it would be an issue, but someone reiterating it, well it gives me a warning to slow down. Thanks for stopping by Rachel and taking the time to leave such a thoughtful comment. Best of luck to you and your blog. Believe me, it can be a little frustrating when you put your effort into a blog, but you don’t receive the number of visitors you expect and nobody is leaving a comment (been there). My best advice is to follow a strategy. Whether you use some of the things that I’ve laid out, or follow another strategy, the key thing is to follow one. Be sure to shoot me an email when you get your blog up and running. I’d love to check it out, and stay in touch with you as we move into the new year.